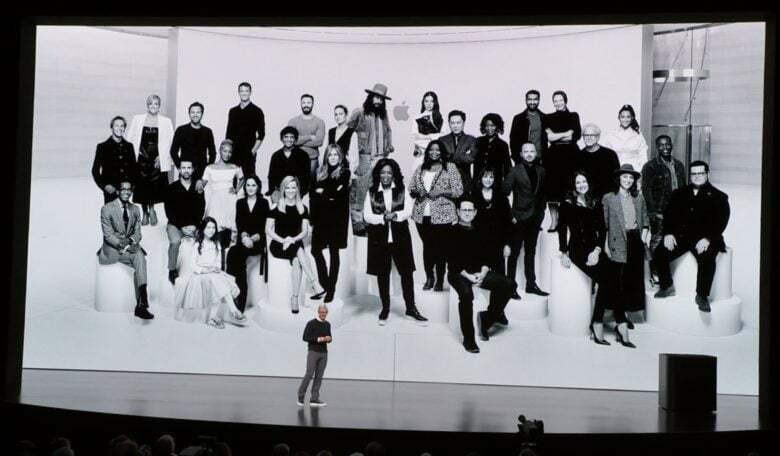 CEO Tim Cook before a picture of actors, directors, and producers of Apple TV+ original shows. Hundreds of TV shows are available through dozens of streaming services, and Apple has just added itself to the mix with a stable of original programs. But rather than increasing the complexity, Apple is hoping to simplify everything by becoming a one-stop-shop for multiple offerings, including HBO, Showtime and more. Apple CEO Tim Cook took to the stage of the Steve Jobs Theater to unveil his company’s latest offering with all the furor that normally surrounds an iPhone launch. The difference here is that Apple can be confident of selling millions of each device it launches, but a streaming TV service is much more risky. It’s not clear yet whether there’s sufficient demand for this company’s offering. Still, as increasing numbers of people move away from traditional cable bundles, they are looking to new options. 58 percent of Americans already subscribe to a video streaming service like Netflix or Hulu. The downside of this change is it requires viewers maintain accounts with multiple companies. Apple wants to simplify that by offering bundles of services for a single monthly fee. Groundwork for Apple TV+ has been going on for well over a year. The company has about 30 in development. Not all of them were announced today, however. Instead, Apple picked a handful to get things off the ground. This includes a reboot of Amazing Stories from Steven Spielberg. Reese Witherspoon and Jennifer Anniston star in a comedy/drama about a morning talk show. Jason Momoa will head up See, a sci-fi epic world-building drama in which everyone in the world is blind. There’s a show about American immigrants called Little America. There’ll also be one for kids about learning to code, and J.J. Abrams and Sara Bareilles teamed up to executive-produce a musical dramedy. These will appear alongside programming from Hulu, Prime VIdeo, Starz, Showtime and other services. Netflix isn’t on board, but that might change of Apple’s service becomes a huge hit. The Apple TV App has been redesigned to display content from all these services, so it’s not necessary to jump between apps to see everything. And the software helps viewers find new programs with recommendations based on past viewing habits. It’s not necessary to watch everything on a small display. After keeping its AirPlay tech a closely-held secret for years, Apple changed course and licensed it to several TV makers. This will allow users to stream video from their phones, tablets and laptops to big screens. TVs from Samsung, LG, Sony and Vizeo with AirPlay are starting to roll out. Roku and Amazon Fire TV also get this tech. But it apparently won’t be coming to non-Apple computers. The updated Apple TV App will launch in May. The Apple TV+ stable of programs will debut in the fall. With the release of its original programming still many months away, the company decided to not say anything about what it will cost. But the company did telegraph that this subscription service won‘t be free. Until we know the monthly service feee, there’s no way to judge how well Apple TV+ will stack up against Netflix, Disney+, and other rivals. iPhone sales are leveling off as the global market for mobiles matures. Apple is still raking in billions from its handsets every quarter but revenue growth from these products is slowing. CEO Tim Cook and co. want to compensate by increasing the revenue that comes in from services. Getting millions of people to sign up for an Apple TV+ streaming service is one way. Another is the news subscription service also unveiled today, as well as a gaming subscription service.